On Wednesday night, Casio threw a blowout bash in a converted pier in Manhattan — a basketball court, specifically — to fête the 30th anniversary of the G-Shock watch. Am I throwing you back to your first Baby-G yet? The event drew an eclectic mix of athletes, actors, and fashion types not only to commemorate the milestone, but also to unveil a new higher-end watch addition to the line, the MT-G: the metal twisted G-Shock with a sleek surface that reminds me that throwing on a menswear watch will never be passé. Throughout the evening and over the deafening noise of Yelawolf and Eminem performances, I asked a few guests about what luxury means to them. 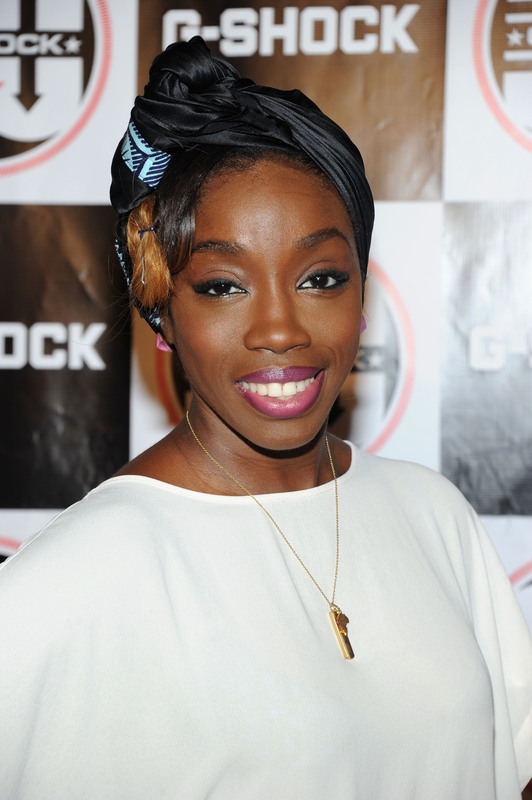 Estelle, singer/songwriter: "Sleep! Sleep is a luxury. When I get to lay in my bed for more than three hours a night, it feels so good. And to preserve my voice, I just don't talk a lot." Louie Vito, Olympic snowboarder: "It's a reward more so. I look at it like I buy a lot of jewelry, I don't really spend my money on other stuff. It's a reminder to keep working hard. Today I was talking to one of my team managers over at Red Bull and I've got to go to New Zealand in a week for work. I'm flying business class over to New Zealand, you sit back and realize how thankful you are. I get to not only go to New Zealand and snowboard, but I get to fly business class. Little things like that I still appreciate. I'm from the Midwest, I wasn't raised in a wealthy family where we flew business class. To me flying business class overseas, I still get stoked on it. That makes me thankful. A luxury is something you don't need, but it's nice to have." Brook Lopez, Brooklyn Nets player: "A lot of people think of monetary value, but for me it's just blessings. Family, friends, and having good people around you." Sean O'Pry, model: "I'm not luxurious, I'm not fancy! But seriously, luxury to me is a watch that was my grandfather's. It's this old 1960s Longines and it's all gold nugget, and it was given to me. It means something." Adam Lippes, designer: "Luxury is a word that is so overused today. I think luxury really has to be something you don't see coming and going all the time, that is really special to you. It can be special in meaning or special in feeling or special in its rarity. It's tough this word luxury and tough to use. My biggest luxuries: I have a country house, it's really probably that. All senses overload. But I was given a Christmas gift this year of a double layer Hermes cashmere massive blanket, and I must say, that's pretty close!"